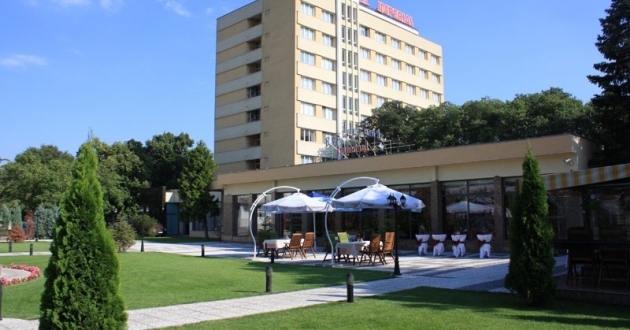 Location: The hotel is located in the center of the city and is close to The Antique Old Town, the Roman Theatre and The Plovdiv International Fair. Accommodation: The Imperial Park Hotel offers 120 single, double, triple rooms and apartments with over than 200 beds in it, each room featuring A/C, separate bathroom, bathrooms with shower, tube and jacuzzi, satellite TV, mini-bar, room service, direct room calls, international phone calls. Sport and facilities: Sport center with sauna, vertical turbo-solarium, infrared cabin for slimming, fitness facilities, massage and other procedures. Meeting and conference facilities: Business Center, Conference Halls for congresses, conferences, seminars, meetings up to 200 persons. Other services: Change, rent-a-car, airport pick-up, city pick up, guarded parking lot. Free of charge Wi-Fi Internet at the Reception desk.